To get your business to where you want it go, or to reach its goals, you need digital marketing. Say you’re a doctor, or a group of doctors with a clinic. However badly people may need your services, they’re not to going to see you if they don’t even know your practice exists, or why they should choose yours over the many other clinics out there. So to get the digital marketing your business needs, you basically have two options: you can either do it yourself, or get someone else to do it. Doing it “yourself” either literally means you on your own or having your own team. Getting “someone else” to do it either means a lone freelancer on his own, or a team at a digital marketing agency. Which option is best for your business, or your clinic, for reaching your potential customers or patients? We give you seven sets of pros and cons to help you decide. Pros: You know exactly what you want in terms of the quality of your marketing materials and you have absolute control over your team members. Cons: You may know exactly what you want, but you may not necessarily have the skills to achieve it. To return to our doctor-and-clinic example, you went to med school, not art school—so you may be great at writing prescriptions but maybe not so great at designing ads. Pros: Chances are, your freelancer has gone to art school or majored in advertising or communications, so the odds of your marketing materials looking like a million bucks are pretty high. Cons: Your freelancer may not necessarily understand or execute exactly what you want in terms of quality, simply because he is not really a part of your business (or a partner at your practice). And because he isn’t part of the pecking order, you may not have as much control over the quality of his work as you’d like. Pros: On top of having an entire team of creative professionals who have the training and experience to provide quality marketing materials, digital marketing agencies have internal quality control systems. Cons: As with freelancers, not being a part of your business or clinic means it may take a while for the agency to execute your vision exactly the way you want it. Pros: Since you or your team really are a part of the business (or practice), you understand exactly how the business works and where you fit in. Cons: Like they say on cop shows, you may be “too close to the situation” and not be able to see, objectively, potential areas for improvement in a marketing campaign. Pros: As a third party, a freelancer will be able to work on your campaign from the point of view of your potential customers (or patients). Cons: As a lone outsider, a freelancer may not be able to fully comprehend or cater to the needs of a larger company or medical facility. He might also have other commitments which can cause him to de-prioritise your business and drop the ball. Pros: As a team, or a company with an organised structure of its own, an agency is better equipped to meet the requirements of larger companies or practices, and to understand how these bigger businesses roll. Also, as a separate entity, an agency can provide an objective and candid assessment of your marketing efforts. Cons: Businesses or clinics that do have their own marketing teams might see agencies as some sort of back-up option. In reality, agencies are not just a plan B, but should be seen as a partner with the same goals as your team’s. Pros: It’s easy to rest assured knowing you’ll get your marketing materials when you need them, when they’re coming from your own backyard. Cons: It’s just as easy to become complacent, and complacency can lead to marketing hiccups. Or, you might simply become too busy with the other aspects of running your business. Pros: The level of assurance and support that you can expect from freelance digital marketing is tied directly to the personal integrity and capabilities of the freelancer. If you’ve worked with a particular freelancer before or are sufficiently convinced of his track record and reputation, you should have no reason for not being able to rely on him. Cons: Because he is a one-man show without back-support, an individual professional may not be able to offer larger companies or medical practices the assurance that another company or agency can give. Pros: Agencies are better suited to bigger businesses that may be looking for more a structured service provider that assures them of uninterrupted servicing and access to a deeper reservoir of expertise. Cons: As with their individual counterparts, what you know about an agency is often limited to what you see online. But again, if you’ve had access to feedback or reviews from that agency’s clients, or seen what the agency can do, then trust shouldn’t be an issue. Pros: In marketing for yourself, it’s in your best interests to do your utmost to get results, and you’ll see the results of your marketing efforts first hand. Cons: Again, having gone to med school, for example, instead of majoring in digital marketing, you may not necessarily have the know-how to maximise your marketing efforts, or be sufficiently skilled in analytics. You need analytics to determine how well your marketing efforts are working, and to figure out how get the most out of them. Pros: It’s also in the best interests of an independent contractor to get results for his client, if he wants to build up a clientele as well as his reputation. Cons: Most freelancers have highly specialised skills, and are rarely “one-man armies”. If you hired a web designer to help you market your clinic, for instance, the odds of that designer also being well-versed in analytics are pretty slim. Pros: A good digital marketing agency is results-driven, and NEO360 prides itself on getting measurable results for clients such as Frednology, Spiking, Suu Balm and Esteem. As a full-service agency, we provide regular analytics reports on all of our marketing campaigns, so clients know exactly what we have achieved for them. Cons: The drawbacks of being a performance-based business affect the agency itself more than the client, in that the agency is remunerated only according to the results it is able to produce. Pros: Your marketing efforts are exclusively for your business or clinic, and you are in direct control of how much marketing work you have to do. Cons: As your marketing needs grow alongside your business, you may not be able to manage if you’re working on your own. Even with a team, you might still be shorthanded and unable to adjust your team’s capabilities accordingly. To cope, you may start to limit your marketing activities, at a time when you should be stepping them up. Pros: Most freelancers only work on one client at a time, which, for you, might be just as good as having a dedicated, in-house marketing specialist. Cons: If the freelancer you engage happens to be juggling more than one client at a time, his increased workload might affect the quality of the work he is doing for you. Should the freelancer become sick or unable to work, your marketing efforts will be put on hold. Pros: However much you increase your marketing activities, you know your agency will be able to handle it because of the entire team behind it. Marketing for your business or clinic continues even if someone on the team falls ill or goes on leave. Cons: You won’t be the only client the agency is servicing, but any agency worth its salt will make sure that each of its clients is given the level of service it deserves. Pros: Working at “ground zero”, as it were, enables you to respond to the marketing needs of your business as soon as they arise. Cons: How well you are able to respond, however, depends on your marketing capabilities, which again may not be your forte if your business is in healthcare or another non-marketing-related industry. Pros: Unencumbered by a formal structure, a freelancer is faster and more agile when it comes to meeting ad hoc marketing requirements. Cons: Speed doesn’t always go hand in hand with quality work, and a freelancer’s agility may be compromised by the amount of work to be done. Pros: If a significant amount of work needs to be done in a relatively short time, it’s easier for an agency to provide the necessary manpower. Cons: An agency is likely to be less nimble when it comes to response time or deliverables because of its structure and size. Pros: Working alone has the advantages of not having to pay someone else to do your marketing. Doing your own marketing, however, may not be quite as cost efficient as it may seem when you consider the time and energy required. Cons: Hiring a dedicated, in-house marketing team involves a significant investment in compensation as well as workspace and technology. Pros: Engaging a freelancer might be a better option for your business or clinic in terms of cost efficiency if you have a very specific, interim marketing requirement. You’ll be able to save on an in-house specialist’s full-time salary, and only have to pay for whatever the freelancer does for you. This arrangement is what makes freelancers so attractive to companies in Singapore. Cons: Just because they don’t work for you full time, doesn’t necessarily mean they come cheap. Good freelancers are well aware of the worth of their expertise, and are likely to factor in personal expenses. Pros: Getting an agency to take care of your marketing is also more cost efficient than hiring your own team. 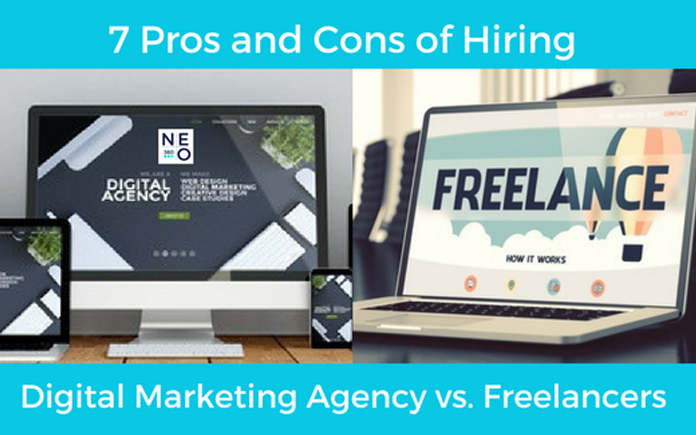 Cons: Agencies are likely to be more expensive than freelancers and are generally engaged for a period of time rather than on a per-project basis. The added expense, however, may be justified by an agency’s ability to ensure service continuity and accountability. At the end of the day, it all comes down to the value that the digital marketing provider brings to your clinic or company. There’s no, one-size-fits-all answer to the question of whether going it alone or getting someone else is better, because no one knows what your business needs better than you do. Come have a chat with us at NEO360 to see which options for meeting your digital marketing needs would suit your business or medical practice best, today.